Belize NMS: Gusty southeasterly airflow continues to dominate our weather. 24-hour forecast: Sunny with a few cloudy spells today and partly cloudy skies tonight. Sunny with cloudy periods tomorrow. Showers or thunderstorms will be isolated and more likely to occur over the south tonight. Today: Winds: E-SE 10-20 kts. With occnl higher gusts. ; seas: Moderate - rough. ; waves: 4-7 ft.; isolated showers or thunderstorms with a few more over the south. Tomorrow: Winds: E-SE 10-20 kts. With higher gusts. ; seas: Moderate - rough. ; waves: 4-7 ft.; isolated showers. Marine Outlook: Saturday night:- winds: East 10-20 kts. ; seas: Moderate - rough. ; waves: 4-7 ft.; isolated showers or thunderstorms mostly over the south. General Outlook: For Sat. and Sat. night:- mainly fair weather with only isolated showers developing. Is it ever going to rain again? My grass is turning brown and I'm having to water plants daily. Do I recall you saying something about a drought this year? I fear you may be right! The Caribbean has become very dry for this time of year. 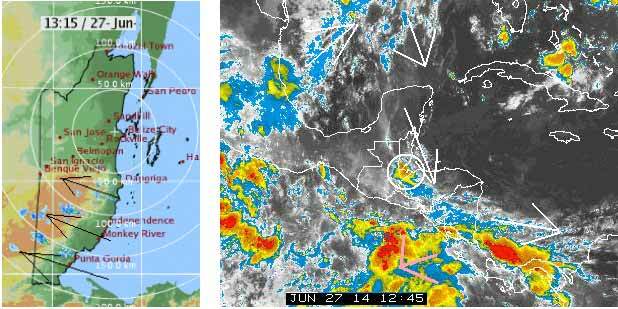 The only significant rain is occurring down in the south west corner around Panama and southern Costa Rica. There are several Tropical Waves ( at 30W and 70W) but the northern ends of these are embedded in dry air with strong wind shear. The area off the east coast of Africa is also unusually dry so there is little moisture travelling from east to west across Africa. Also the sun is extremely quiet with a weak solar wind to stir things up here in this part of the world. 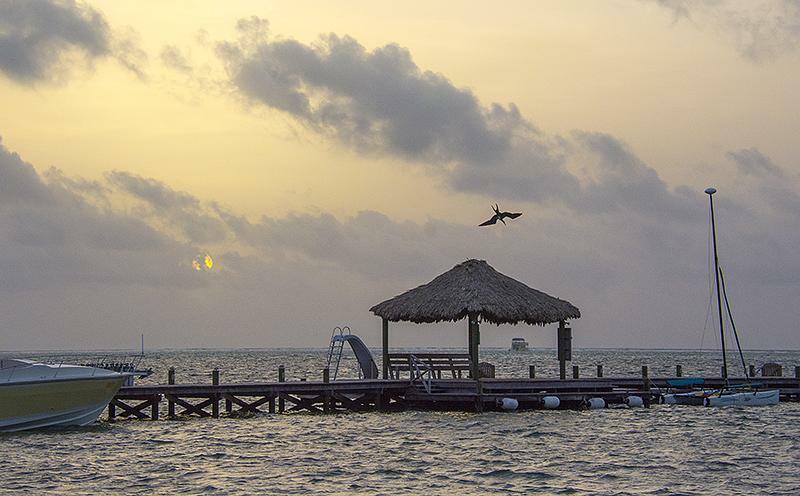 On Ambergris Caye this morning it's calm and sunny with an expected high of 89. There is significant rain showing up this morning over southern Belize, mainly in Toledo. Notice the local ITCZ activity over Toledo circled.. . .. That rain will die out and it will be mainly a dry day.